At the end of most biographies the author assembles a trophy case of primary sources, but Pulitzer Prize-winning biographer Stacy Schiff begins with a litany of research deficits that would intimidate anyone hoping to say something original about the Egyptian queen. “We have little idea of what she actually looked like,’’ she states at the outset (though she does remind us that, as the descendant of a line of Macedonian Greeks, Cleopatra was probably quite light-skinned). “Our most comprehensive sources’’ — the ancient writers Lucan, Appian, Plutarch, Dio — “never met Cleopatra.’’ “No papyri from Alexandria survive . . . We have, perhaps and at most, one written word of Cleopatra’s . . . a royal decree with the Greek word ginesthoi, meaning, ‘Let it be done.’ ’’ This brief, confident edict must have been a touchstone for Schiff in her own approach to recreating a life enshrouded in “a conspiracy of silences,’’ because, despite the obvious problems with sources, she forged on. “Cleopatra’’ explodes with scents, images, and intrigues that manage to perpetuate the 2,000-year-old notion of Cleopatra as the first human being to embody the phrase “rich and famous’’ even as Schiff attempts to dismantle many of the myths associated with her name, myths fostered in part by the steady stream of plays, novels, and films made about her over the centuries. Interestingly enough, the latest project may involve Schiff’s book, which is in development at Sony Pictures with director James Cameron considering a 3D version starring Angelina Jolie. This book is as much a biography of the city of ancient Alexandria as it is of its last pharaoh, and much of Schiff’s prose is devoted to extolling the sophistication, wealth, and sumptuousness of Alexandria in contrast to “squalid and shapeless’’ Rome, “an oriental tangle of narrow, poorly ventilated streets and ceaseless, shutter-creaking commotion, perpetually in shadow, stiflingly hot in summer.’’ Alexandria “was a mood-altering city of extreme sensuality and high intellectualism,’’ with 20-foot-wide paved avenues equipped with sewer systems and nighttime lighting. The 400-foot Pharos lighthouse, one of the Seven Wonders of the Ancient World, guarded Alexandria’s harbor, and the pyramids were already ancient by the time Caesar arrived in 48 BC. Yet when Cleopatra got to Rome, the Coliseum did not yet exist and neither did the Pantheon. “Rome remained provincial,’’ a civilization with a talent for possessing and plundering great cultures but still refining its own. 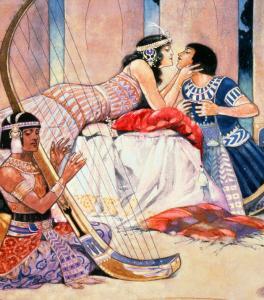 “Even in Cleopatra’s day there was such thing as ancient history,’’ Schiff writes, and her country “had been in the hospitality business long before the rest of the world so much as suspected gracious living existed.’’ Cleopatra arrived in Rome bearing gifts, including “jars of Nile water’’ — thought to have magical healing properties — “shimmering fabrics, cinnamon, tapestries, alabaster pots of fragrance, gold beakers, mosaics, leopards,’’ and possibly a giraffe. Few of these items had ever been seen in Rome — certainly not the giraffe. Schiff is clearly inspired by the drama of Alexandrian culture but, like the great city itself, her imagery is sometimes too rich for its own good. Her descriptions of “a city of cool raspberry dawns and pearly late afternoons’’ in which “no flower . . . ever completely stops blooming’’ lose impact after 300 pages of similarly fecund prose. I’ve often wondered why every Roman period play or film must be enacted with the intonations of Laurence Olivier (if we’re going to impose a modern speaking style on Cicero, why not an Italian accent — he lived in Rome, after all). Strangely, in reading this book, the voice of Judi Dench kept popping into my mind each time I plunged into a sentence such as, “The Romans had the temperament of wolves,’’ or, “There are cities in which to spend a fortune and cities in which to make one; only in the rare great city can one accomplish both.’’ Most of the time I was too overwhelmed by towering ivory sphinxes and gilded palm trees to question whether it could actually be true. Still, merely contemplating a biography of Cleopatra required audacity, and Schiff more than succeeds at reframing her misunderstood queen in a way that is both scholarly and entertaining. Schiff makes a strong case for Cleopatra’s political genius and her ability “to turn the implacable Roman tide to her advantage.’’ Throughout one of the Roman republic’s most chaotic periods, Cleopatra repeatedly managed to navigate a favorable course for her country. “She got a very good deal right’’ in the political firestorm of her era, Schiff argues, “and one crucial thing wrong’’: her fatal loyalty to Marc Antony. When Cleopatra died, much of ancient Egypt’s glory died with her. All the great ancient monuments of her day — the Library of Alexandria, the Pharos lighthouse, her palace — disappeared. “A great deal that Cleopatra knew’’ — knowledge of medicine, astronomy, mathematics, technology — “would be forgotten for fifteen hundred years,’’ Schiff writes, and “[w]ith her death Egypt became a Roman province. It would not recover its autonomy until the twentieth century.’’ With this biography, Cleopatra manages to recover some of her own dignity, as well. Buzzy Jackson is the author of “Shaking the Family Tree: Blue Bloods, Black Sheep, and Other Obsessions of an Accidental Genealogist.’’ E-mail her at AskBuzzy@gmail.com.